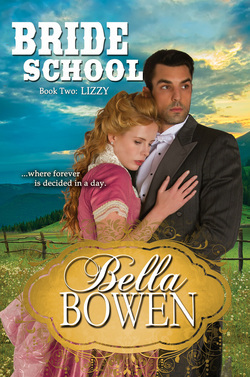 Lizzy Tanner is thrilled to be chosen for the Bride School at Diamond Springs Ranch. But when her prince comes calling, she doesn't fit his glass slipper. Unimpressed by what Boston has to offer, Jacob Montgomery is tantalized by the idea of a Western bride. But the one he wants is too young and too prone to trouble to suit his high society life. Molly doesn't believe the attention of her backwoods cousin is as harmless as her father insists. In fact, she’s starting to think her father isn't as oblivious as he seems and she’d be a fool not to flee. She jumps at the chance to become a Diamond Springs Bride, hoping that her future husband will be a kinder man who will allow her to be happy. But she may not get the chance to marry at all if she can’t put her past nightmares behind her and do what she fears most—dance. For years, Samuel Craighton has been bringing home both animals and people with broken wings, but his soft heart can’t bear much more. He applies at the famous Bride School for a perfectly trained and capable woman to help him tend to the wounded he already has. And luckily, the first bride he meets is more than he dared hope for. He quickly throws his hat in the ring, but finds she’s damaged too. And to keep a promise, he must choose a different bride. But if he does, another man is more than happy to scoop her up, broken wing and all. Mary agrees to take the place of a potential bride so she can see what it's like to dance with a gentleman. But soon, she's caught up in a Cinderella nightmare. The prince turns out to be Rebel, the boy she fell in love with long ago, but if she reveals her identity to him, another will pay dearly. It's a Western fairy tale all right, but the magic slipper belongs to someone else!